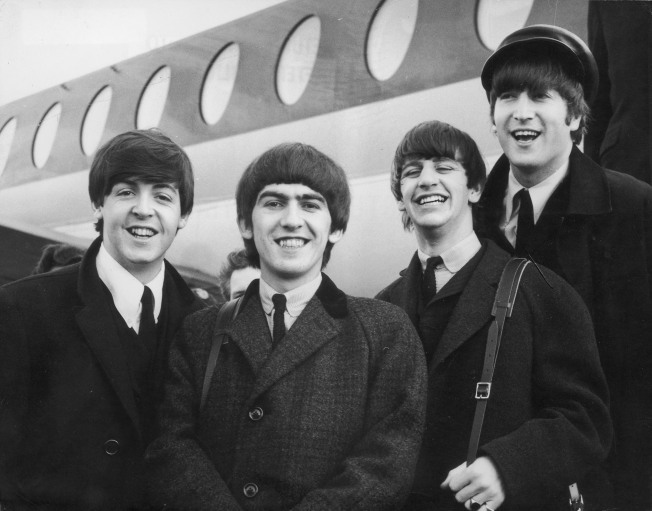 The Beatles, left to right, Paul McCartney, George Harrison, Ringo Starr and John Lennon (1940 - 1980) arrive at London Airport February 6, 1964, after a trip to Paris. Beatle George Harrison will posthumously receive the 2,382nd star on the Hollywood Walk of Fame April 14 in front of the Capitol Records building, the same day the label will announce plans for a new Harrison music release. Harrison's widow, Olivia, and his son, will accept the star. Harrison was The Beatles guitarist, and wrote such songs as "Here Comes the Sun," "Something" and "While My Guitar Gently Weeps." After the group disbanded in 1970, he organized the Concert for Bangladesh, had a solo career, was part of the Traveling Wilburys and produced films. He died in 2001 of lung cancer at the age of 58.